There’s a movement afoot, a seismic shift among educators and parents, a longing to engender “Mighty Girls”*, to create “The Gutsy Girl”*; daughters who are resilient, persistent, courageous, problem solvers; female students who know themselves and are willing to push their limits. 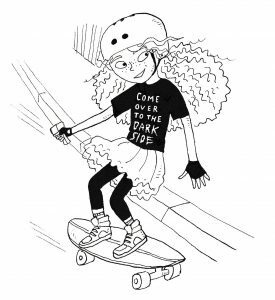 Girls who fulfill their potential, stand up to bullies, and hold their heads up high. I know I want my daughter to be confident, adventurous and willing to take risks. Unbeknown to me, when I set out to write “Maddie Makes a Movie,” I was to become part of this change. 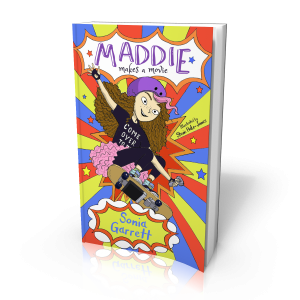 Maddie is a risk taker, a resilient problem solver in the face of her many problems, and a character with her own unique identity. So how do we, as parents create opportunities for our girls to excel? The desire to protect our children from harm is innate and reflexive. It can be all consuming but parents need to push through their own anxiety and let children take acceptable risks. When introducing my daughter to the North Shore Mountain Bike trails, I asked a very experienced rider to lead the way. I still had to bite my tongue and resist the urge to scream Careful! And Slow Down! With a great deal of self-control, I replaced my concerns with a sense of joy at hearing her whoops and cries of delight. Find genuine examples of times when you are heading outside your comfort zone and talk about the process. For me, that usually involves technology. Last summer, I wanted to create a website, and expand my presence on social media. I procrastinated to an embarrassing extent. Then feeling totally inadequate, I started, faced problems, searched for answers that seemed to come in another language, and finally succeeded. Nature doesn’t care what a girl is wearing but it does teach your daughter about appropriate clothing for the adventure. Dusty trails demonstrate the effectiveness of good hiking shoes. Snow covered mountains reveal the limitations of princess dresses or cut off jean shorts and lacy crop tops. Climbing trees make leggings and t-shirts an obvious choice. As adults, we are constantly weighing up the pros and cons of activities. Voicing these can help our daughters learn this important life skill. When our daughter wanted to ride her skateboard to school we asked her to write her own risk assessment. Aged ten, she listed all the potential hazards and came up with a safe solution for each risk. I am hoping the same process will work when talking about teenage parties, dating, career choices and other milestones. If you always hold your daughter when she swings on the monkey bars, how will she ever know if she can get across on her own? Allow her to scratch her knees, make a mess (and clean up after herself), and construct a cubby that collapses. Then let her try again, and again. Resist the temptation to offer solutions. Instead, acknowledge the situation and the emotions that accompany it, then reassure and encourage. It’s okay. What could you do differently when you try again? The only constant rule I have in parenting is “never assume.” Don’t assume boys will feel brave and girls will be conscientious. Let them surprise you as they shoot for the stars. Over the coming weeks, I will be writing a series entitled “Gutsy Girls.” Come back to read the inspiring stories of women who are fulfilling their dreams, and defining what it means to be a woman in 2018. Whose story would you like to read about?